Victoria Falls known locally as Mosi-oa-Tunya which translates as “The Smoke that Thunders” are without doubt one of the world’s true natural wonders. No trip to this part of Africa is complete without marvelling at the constantly changing waters, getting soaked by the spray, or capturing the famous rainbows on film. Victoria Falls are 1.7 km wide and over 100 metres high, at peak times 10 million litres of water plunge over the edge every second. Below the falls the waters of the Zambezi are forced between the towering cliffs of the Batoka Gorge creating a series of rapids which offer world-class white water rafting. The falls themselves are the big attraction and there is plenty to see and do. 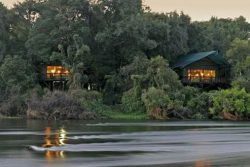 Victoria Falls are close to Chobe Game Reserve in Botswana and Hwange in Zimbabwe both of which make for an excellent day trip. 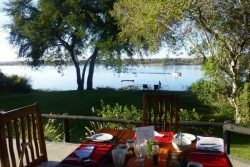 There is quite lot of game in the Victoria Falls area, elephant and other wildlife are regularly spotted along the Zambezi River as well as in the small Mosi Oa Tunya National Park. 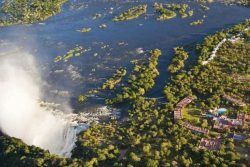 Take an exhilarating ride on a raft along the white water rapids below Victoria Falls or a microlight flight over the falls for the thrill of a lifetime. The falls are spectacular at any time of year. The falls are at their most spectacular in the late wet season around March or April but due to the reduced amount of spray other times of year may be preferable for photography. The rafting season is dependent on water levels and usually runs between July and October. 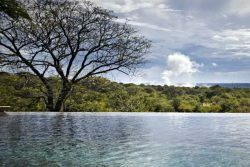 Clear sunny days from May bring good game viewing, as the weather heats up, the bush dries out and game viewing improves. 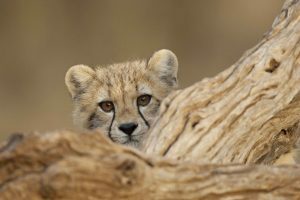 July brings excellent game viewing which continues right through to November! The white water rafting season usually begins in July too. 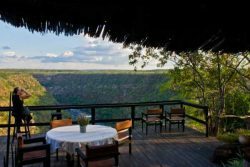 Although ordinarily the ‘dry season’ is considered the best time to safari, we would recommend that you are mindful when to view Victoria Falls. October through to November is a time of low water levels combined with hot and humid weather. 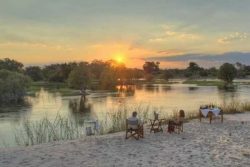 You may capture some clear images without misty spray but the falls may have dried out completely on the Zambian side. 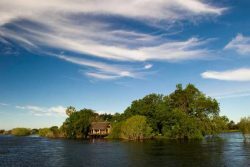 In May you can expect to experience clear blue skies and sunny days, the bush is beginning to dry out. The nights are notably cooler, early safari season begins. A good time to view Victoria Falls. December has short but regular thunderstorms followed by sunny periods, game viewing is still fairly good! 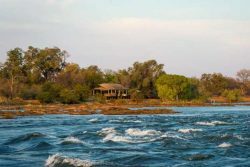 April and May are normally dry months at Victoria Falls but due to the volume of water in the Zambezi River are two of the best months to see the falls at its most spectacular.